Do you enjoy shopping and just love worldwide famous brands and celebrities? Do you want to know which items are currently trending among the top influencers? You can do it all, by simply getting this amazing app that we present to you today. The name of the app is Envicase, and it can become your personal showroom. If you have it in your device, you will get a unique chance to become one of the top influencers in the world and be envied by people from around the world. 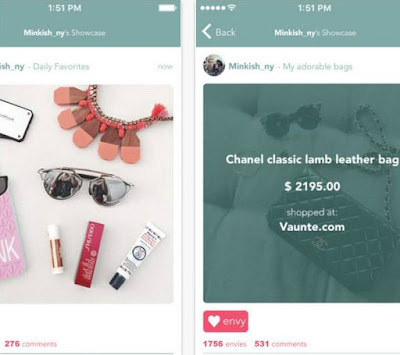 The Envicase app is the perfect app for users that want to show the world their personal items, clothes and shopping deals. It contains dozens of cool features and that is why it is one of the best rated apps in the Lifestyle category on the iOS platform. You will be able to create your own showroom and all of your posts can be seen by other users and be able to press the “envy” button in order to get the appreciation you deserve. With every posted item there is an incredible and fun story that follows it. You can share all your postings to your other accounts, like Facebook, Instagram and Twitter as well. Prepare yourself to connect with other people through the items you own, share your stories, provide yourself with useful shopping tips, and "envy" others. Get this incredible app for free on the App Store.